Over the past week, Sahara Desert-like weather conditions marched north into Spain and Portugal. This extreme, abnormal heat brought with it a rash of severe wildfires. And, unfortunately, these are exactly the kinds of conditions we should expect to see more and more of as a result of human-forced climate change. Yesterday, the temperature hit a hot, dry 40 degrees Celsius (104 Fahrenheit) just west of Lisbon, Portugal — temperatures more typical to the Sahara desert hundreds of miles to the south. On any normal August day, this Atlantic coastal town would expect to see readings around 28 C (83 F). To the north, a sprawling heat dome of high pressure has tucked beneath a big jet stream wave for much of the past week. Pulled poleward by near record-low sea ice extents, this atmospheric brute — one of a new breed made stronger and thicker by human-forced warming of the atmosphere — funneled in brisk winds even as it baked Portugal’s lands and islands day after day. Fires, already sparking in the extreme heat, expanded and multiplied. By Wednesday, more than 180 of these blazes raged over both Portugal and its island archipelago of Madeira. On mainland Portugal scores of fires cut roads and power lines. Whole villages were emptied as the blazes encroached, numerous homes were destroyed and one life was tragically lost. Everywhere, firefighters scrambled to get a toehold in containing multiple out-of-control fires with a massive mobilization that included more than 4,200 emergency personnel from across the country. This abnormally tough-to-control fire situation spurred Portuguese officials to seek aid from the EU. The request drew a swift response from Spain as well as Italy, which immediately sent three fire suppression aircraft to aid in the massive effort. Southwest across the Atlantic, the Portuguese island of Madeira, one of several islands in the Madeira Archipelago, was also burning. Abnormally hot conditions over the past week with 35 C (95 F) temperatures and strong, dry winds had fanned large fires running across the island. By Tuesday, Archipelago capital city Fuchal saw numerous fires rushing toward town. Both firefighters and the military mobilized, but this combined effort was unable to prevent the fire from entering the town. Three people were tragically caught up in the blazes as 40 homes burned and a famous five-star hotel was consumed to its foundations. Across town, two hospitals shut down operations as fires encroached. As a result the 379 people injured by the blaze were forced to flood into the few remaining medical facilities. As of this afternoon, fires still rage around Madeira. One thousand people have been evacuated from the island and emergency officials are still scrambling to deal with a difficult-to-control fire situation. Many visitors not already evacuated were reported to be sheltering in a local sports stadium. Like many regions of the world, Portugal experiences an annual fire season. However, this year’s fires are far more extensive, they rage under hotter-than-normal temperatures, and they are being fanned by strong, dry winds. In short, 35-40 C readings are not normal for any time of year in Portugal. The fire conditions, therefore, are far worse than what Portugal typically experiences. But in the new world forced to warm by human greenhouse gas emissions, such conditions, along with a much more extreme wildfire potential, are far more likely to occur. It is worth noting that these fires have not yet reached the extent of the 2003 blazes. Back then, a massive European heatwave that many scientists have attributed to human-forced climate change helped to spark wildfires that killed 19 people and burned fully 10 percent of Portugal’s forests. But it’s clear the 2016 fires are already among the worst Portugal has ever experienced — and this fire event isn’t yet finished. Over the coming week, temperatures are expected to range from 35 to 42 C, providing no hint of relief in an already dangerous fire situation. I consider this to be in bad taste. I initially had the same reaction, but after I thought about it a bit I decided that it’s ironic. After all, this is basically the attitude of mainstream America. Once you are aware of the full implications of our “predicament”, it is a constant assault. For example, when I searched for “crop loss” on Twitter I was inundated with photos of young women with bare midriffs. I tend to agree that it’s in bad/poor taste, but then how can any thinking person continue business as usual? Yet, here we are! I dunno. I guess that, with the one exception being climate change denial, there’s not much that offends me anymore. The crumbling ‘Free Market’ system does denial awfully well. The root is death denial, really, and, unlike the ancients, we look at that land from whose bourne no traveler returns, as either an eternal transcendental hotel in the sky, or a topic not to be considered. As Montaigne observed, every man, no matter how decrepit, still thinks he has a good twenty (that’s probably thirty these days) left in him. And how much worse in the denial of universal death. It was always coming, some time or other, even if only when the Sun goes red giant, but no-one dares recognise that, unless we pull our collective fingers out, and work together, like crazy, it will certainly be here in the life-time of those already extant. The question must be not to spend our span preparing for death, but in living a meaningful life, because that’s all we have. We shouldn’t let maniacs deny it to our descendants. Well said, MM. We have to work together like crazy, indeed. Have we evolved enough to do that, is the question. Are we, as a species, capable of transcending our jungle-born instincts (self-preservation, competition, greed, might makes right, etc) in favour of a global rational co-operative co-ordinated effort to fight this climate crisis in the name of the common good of all life on earth? There are promising signs here and there that we have in fact developed this kind of moral intelligence, but we need to ramp it up and fast. .
I’m inclined to believe this sentiment. In addition to the social conditioning and stigma/sanitization of just about everything from *literal* birth to breastfeeding to death, people suffer from a lack of nature. We’re taught not to appreciate the messy bits. That is, I suspect, until they’re gone. Irony was intended – albeit from a rather peculiar English perspective. Our present situation is just so dire that I’d rather laugh than cry. I actually listened/watched the video, and watching those dance moves gave me a chuckle. I was able to set aside my woes for a moment. Thank you for that! Someone here made the comment a while back that we’re no smarter than yeast (or something to that effect.) I tend to agree given the complete disregard most folks seem to have for what lies ahead, which is the irony I found at the heart of this post. Better to laugh when you can. Plenty of time for tears in the near term. I was at a zoo, years ago, when smoke from fires in the nearby mountains blotted out the Sun until it was just a red dot. The smell of burning was strong, and the poor caged animals were freaking out. The light was very strange and you could see the panther’s leopard spots under the black. We’re all like animals in a cage these days, and not an enclosure that we really understood as we were led to build it. 10,000 people evacuated. Marseille-Provence Airport is closed. In a lot of places like Portugal, the powers that be stupid planted millions of eucalypts. The locals rightly hate them, and some even pull up saplings in plantations. I love them in the bush, but nowhere near my house, thanks. The vapour that envelops their crowns is highly volatile, so ‘crown fires’ move with awesome rapidity when the dry, hot, north wind blows. That vapour will spontaneously combust at 50 degrees Celsius, which would already make them a dodgy idea in Iraq and Kuwait and elsewhere. You are absolutely right MM, regarding the insane and relentless plantation of Eucalyptus globulus (Blue Gum E.) in Portugal. The Portuguese state is quite weak, which allows it to be easily captured by stronger foreign states and private interests. From my observations of the country, I’ll venture to say that it has been captured by the football Mafia, the EU Mafia and the big pulp and paper companies, at least. The big pulp and paper companies have a huge economic and political influence in the country, being able to almost write some laws, specially those allowing indiscriminate plantation of Eucalyptus everywhere. You go to the dying small villages in the hilly and heavily forested region of central and northern Portugal, and most people there will be very much against the plantation of Eucalyptus, but there will always be some money fawning acolytes that see the forest as not something providing lots of useful environmental services, including guaranteeing biodiversity, but as just a cash cow with a fast ROI, i.e. fast growing trees, to be exploited until it just dies, or in this case, just burns down. Under very dry and hot conditions, Eucalyptus trees are extremely flammable, and when burning they can literally explode, thus causing the fire to expand faster in all directions. Combining this human stupidity with AGW is a recipe for an even bigger catastrophe, this is what has just happened, and will probably carry on happening, unfortunately for the flora and the many other animals living in the forests. Quite right, Doc. Capitalism is a form of cancer, highly malignant in that it demands profit be maximised,come what may, and with an horizon of the next reporting season, often now quarterly, or every three months. You would have to try very, very, hard to create a system from scratch better designed to destroy the natural world and exterminate humanity (our current predicament) but because the capitalists own all the MSM, any voice of dissent from this auto-genocide is forbidden, and the advocates relentless vilified. And that’s in the glorious West. In the poor world environmentalists in their hundreds are simply murdered if they get in the way of greed- insatiable greed. Meanwhile millions of little metastases in pseudo-human form spend their days gibbering about, demanding ‘Growth! Growth! Growth!, like bacteria in a petri dish, about to get a rude shock. The Portuguese have a saying: “Europe wipes its arse on Portugal”, since so much of that Eucalyptus wood is turned into toilet paper for the European market. Mulga, for all its faults I think it’s incorrect to single out capitalism for its destructiveness. Human beings have been pretty good at trashing their fellow organisms well before that. Hence the extinction long long ago of large land animals over most of the Earth, with the notable exception of Africa. The fault is in ourselves as much as in our economic arrangements. I single out capitalism, Bill, because it is based on turning living stuff into dead money or capital. It is predicated on profit maximisation, and infinite growth, if only to pay off interest on money borrowed. It cannot, then, I believe, do other than destroy. Under capitalism if 99% of capitalists resile from committing some heinous act, say clear-fell an ancient forest, you will certainly see that remaining 1% leap to the opportunity. Moreover, destroying nature makes remaining specimens more valuable because scarce, therefore more likely to be destroyed for increased profit. And under capitalism there is no limit to greed and inequality, as we see today across the planet. Increased poverty drives desperate destruction by the poor, in order to survive, and capitalism’s insistence on growth means that it decrees and ever expanding population. In fact a fall in the rate of population growth, as in Japan, is seen as a catastrophe. They’re a few of the reasons that I see capitalism, particularly its fundamentalist Free Market neo-liberal form, as the chief culprit in our predicament. Prominent organizations try for the third straight election to get candidates to answer questions about climate change and other crucial issues. Science, especially climate science, has again gotten so little attention in the presidential campaigns that a group of more than 50 science organizations is seeking to push it into the conversation. The group, which includes the American Association for the Advancement of Science, The National Academy of Sciences, the American Geophysical Union and Duke University, represents more than 10 million scientists and engineers nationwide. It is calling on the U.S. presidential candidates to address a set of questions related to science, engineering, technology, health and the environment, including climate change. It is also encouraging the media, the moderators that ask the debate questions and voters themselves to ask these questions of the candidates in the course of the campaign. “Science issues are coming to influence more and more of the policy dialogues, and politicians seem to be having a hard time incorporating complex science information into their policymaking process,” said Shawn Otto, chair of ScienceDebate.org, which is organizing the initiative. It’s good to see the major science orgs pitching in on this one. It’s worth noting that climate change was a pretty big issue in the primaries (at least the democratic one). Let’s hope that we can push it more prominently into the general as well. Fires like this seem so much more threatening and an imminent threat to us all when it is affecting a place I know well. This island is 300 miles out in the Atlantic off Africa and usually has a warm damp Mediterranean climate with an average temperature of 19-20C. A beautiful place and lovely people, I am so sorry this is happening to them especially after the extreme floods they had back in 2010. But wildfires are becoming far more common there. The Hadley cell is expanding to encompass the Mediterranean, and so this will soon become common, until there is little vegetation left to burn. The Med on its own is not a large enough body of water to mitigate this expansion. This has given me an idea for a new Superhero movie: “Trumpman fights the Hadley Cell.” Superhero Trumpman, aka Donald, King of Hearts-because we all love him so-, fights the evil George Hadley and his Chinese allies by singlehandedly driving the Hadley cells back towards the Equator. Instead of fighting fire with fire, Trumpman’s genius is to fight hot air with even more hot air. Emblazoned across his chest is his favorite image, a picture of himself. He is failed by his sidekick, Boy Blunder Pence, and he has to undo the bungling of the Clintons, the Bushes, and Obama, which makes his final triumph all the more moving. By the way, has anyone seen my bottle of Largactil? Good old Largactil-always works a treat, otherwise it’s time for the paraldehyde. I like Trumpman muchly. A hero of our times! Thank you Robert for highlighting in this blog report what we are experiencing here in southern Europe right now. The Portuguese fire-fighters after 5 days are at the point of exhaustion and are having difficulty in keeping going in the harsh conditions there. Very strong winds coming down the Rhone valley fanning the flames as well as wind problems over north west Iberia and through the straights of Gibraltar where I saw over 50 MPH or 80 KPH recently on the wind maps. The French are having massive problems north of Marseille with the flames reported to be at the outskirts of the city. Hot to very hot conditions. Strong, dry winds. Classic fire hazard situation. We’d tend to see similar conditions at this time of year. But with climate change, you’re loading up the dice for more heat. So the fire potential bar gets pushed up. Very sorry to see what’s happening in Marseilles as well. Current wind map for Iberia and the western Mediterranean. Latin American Herald Tribune reports today Worst Drought in 30 years Causes Nearly 50,000 Fires in Bolivia. Almost 4 million hectares (9.9 million acres burned so far this season. Some expected to burn until December. Thanks Kevin. The whole region down there from Bolivia through southern Brazil is seeing rather bad fires due to drought this year. Part of the larger impacts to the Amazon mentioned earlier. Serra da Canastra is one of the main recharge areas for water ways in the east of Brasil. The source of the San Francisco River, the most important river in Brasil and the only river of the Northeast that would never go dry (except it did during that last drought) is there. Destruction there will atract even more drought and water shortages, compounding on the problems we had in 2014-2015 (and that some of my short-sighted compatriotes think already gone.). It was already confirmed that the fires started by criminal acts, though the criminals haven´t been caught yet. Other national Parks, like Chapada dos Guimarães, are also on fire. And many, many others. We had a 203% increase in the number of fires for July, compared com 2015. It´s sad to see all those fires, one of the most dramatic and fast forces of destruction, the coronation of drought and a source of droughts to come. And so often started directly by human hands, the damage then compounded by the indirect action of all that CO2 that human hands released in the atmosphere. And to see that they´re not just here, but worldwide… on a now dry Portugal, on now flamable permafrost in Canadá and Russia, and others. It’s time we beat our weapons into plowshares. Bullets and bombs aren’t going to beat the new brute on the block. Thanks, Loni. I wish we would. Climate change is tough enough to tackle without warfare making matters worse. Thank you for your exceptional work, Robert. This is simply not being reported in Canada. It’s ignored. That’s one way to pretend that climate change isn’t happening. Don’t mention it. Another way is to report its effects without mentioning the cause, except for the mandatory hat-tip to the “natural” phenomenon of El Nino, thereby hinting that maybe the other warming Is also natural. CBC reports on climate change so as not to alarm Canadians into thinking they might have to, you know, do something drastic like stop driving so many big pickup trucks so far so fast. Precisely the same here in Australia, Cate. Deny and ignore, then repeat. Ad infinitum. I don’t know if this is being reported over the pond but it’s not just Madeira that’s on fire. Around 7% of the forest area of the island of La Palma – one of the most pristine of The Canary Islands – has been burned down in the last few days too. Very sad to see. But Leslie’s right. The fires are popping up over the islands in the NW Atlantic, in Portugal, in Spain and in France. It’s a pretty widespread event. As for reporting… It’s kind of been this way for a long time now. The media’s in denial and downplay mode for the most part. A kind of fatigue denial. But, yeah, it’s pretty widespread. On the one hand you have sources like Fox that actively go after climate scientists and on the other hand you tend to have sources that want to downplay climate risks or to remove the kind of language that would send a signal that something’s going on that’s abnormal. Some of it I think is rather unintentional. People naturally want to keep hold of the comfort of what’s familiar. And the meme of the familiar RE extreme weather is pretty much ingrained. So getting the right mix of urgency and level-headedness when reporting on climate change is a tough balance to strike even by those who are trying to raise awareness. Robert, in my view, you do an exemplary job of hitting that balance and of getting the right mix of urgency and level-headedness in your reporting. The MSM would do well to read, mark, learn, and inwardly digest this blog!. I want to add that as a Canadian, I can’t excuse the CBC. I find it unconscionable that my public broadcaster does appear—appear—to be making an editorial choice to play down climate change as an issue in relevant stories. I wonder what is driving that choice—is it fear of being perceived as alarmist by Canadians, who tend to be rather laid-back about most issues? or is there something else going on, perhaps some nudging—I won’t say diktats—from higher up, to ignore the issue as much as possible? or perhaps CBC brass are simply unwilling to risk offending the higher-ups, for whatever reasons (eg, the threat of funding cuts?). Maybe a little of all those factors are at play. Either way, I am being short-changed as a taxpayer in that my broadcaster is not presenting the whole truth about “extreme” weather in choosing to treat it simply as an oddity caused by El Nino. Never count out fossil fuel industry influence, especially in a state like Canada, where the investment in extraction has been massive and big bets have been made on future economic growth coming from the sales of the carbon emitting fuels that would be extracted. Globally, this is a huge problem. While the events are being reported in the UK (despite continuous Olympics) it is not really a surprise since so many of us holiday in the Canaries, Madeira, Portugal or S. France. However there is no mention of the reason for these increasing firestorms – it is almost like censorship. Jeremy, it is censorship. If you listen to the MSM there is 100% Groupthink on every subject, and fossil fuels are worth tens of trillions and support, through their valuation on the books of mega-corporations, including the vital banks, the entire capitalist edifice. There NEVER will be honest reporting there, with the urgency and candour required. London will be aflame (like The Day the Earth Caught Fire)and they’ll still be ignoring it. The MSM are a lost cause. Study provides details of possible link between Zika, severe joint condition at birth. OT, but more bad news on the Zika front. A possible association with arthrogryposis, a rare and usually devastating congenital abnormality. Stay tuned, more work needed. PS. This brings up the possibility Zika destroys motor neurons in the spinal cord as well as in the brain. (“MRI of the spine in four children showed apparent thinning of the cord and reduced ventral roots.”) Would not be unexpected with a neurotropic virus, but it does expand the Zika profile. BMJ 2016; 354 doi: http://dx.doi.org/10.1136/bmj.i3899 (Published 09 August 2016). When and why did Zika become so malignant? So there are probably numerous tropical viruses like Zika — tucked away in remote corners of the world, waiting for a vector that will allow it to become more widespread. The issue with Zika was that it probably always had this damaging potential in human beings. But, for the most part, infection rates were low and exhibited symptoms were likely confused as having come from other causes. Due to climate change, the mosquitoes capable of carrying Zika can now live at much higher latitudes. As a result, large populations are being impacted and we’re getting a better idea almost weekly of what the virus is capable of. As a virus becomes more prevalent in a population, it’s then that we see the wide range of potential effects that the virus is capable of. Part of this is due to representation within a population. The other issue is that the virus will mutate as it expands within a host population. As such, you might get slightly different effects as the number of strains increases. Some will usually tend to be more damaging, while others are less so. Mlparrish is right in that Zika damaging motor nuerons is not outside the realm of what is possible given the brain and nerve systems these kinds of viruses tend to target. Dido. Excellent question which, as far as I am aware, is not being addressed. Are these abnormalities restricted to northeast Brazil, the region of the original outbreak or traceable to that region. Don’t really understand the question. Which abnormalities do you mean? Here I am referring to arthrogyroposis and microcephaly and any other birth defects seen within the area of the original outbreak of a large number birth defects first noted in northeast Brazil. Systematically unaddressed or reflexively poo-pooed by GMOers has been any analysis of a link between Oxitec’s GMO Aedes aegypti and the surge in birth defects, most dramatically microcephaly, in the same area. I suggest for a starter to read Oliver Tickell’s article in The Ecologist. Web address below. Dr. Mae Won Ho’s response to a response to the article I consider particularly important. Zika virus is not the only flavivirus carried by A. aegypti and other mosquitoes. The most widespread in the U.S. is West Nile virus and it is carried by 40 species of mosquitoes within the U.S. West Nile was first discovered in Uganda in 1937. The strain introduced to the US came from Israel in 1999. Interestingly, Zika was also discovered in Uganda. The year was 1947. The carrier there was Aedes aegypti. In 2007 there was an outbreak of Zika on the Yap Islands. There were no birth defects and no deaths. The carrier there was Aedes hensilli. No, they aren´t. Abnormalities have been reported in other regions also (Southeast Brasil, Bolivia, Colômbia, etc). And there was an study comparing the genome of zika in Northeast Brasil with the Zika in Polynesia, showing little divergence. The hypotheses that the virus mutated in Northeast Brasil has not been backed up by much evidence thus far. The difference seems to be more about how many have been infected. If 1 in a 1000 children are born with microcephaly in a population affected by zika (the statistics thus far) and 3000 people are infected in an epidemics (about the number infected in the polinesian epidemic), 3 children are expected to be born with microcephaly (about what happened, also… but that´s a small enough number that the association with the virus was missed). The only good thing about this epidemics is that it seems that once someone is infected with zika, the person gets immunity to it in the future. A bit like toxoplasmosis, but more drastic. The news here in Brasil report that the epidemy will probably last about 6 years here, dwindling when enough immune people are around. 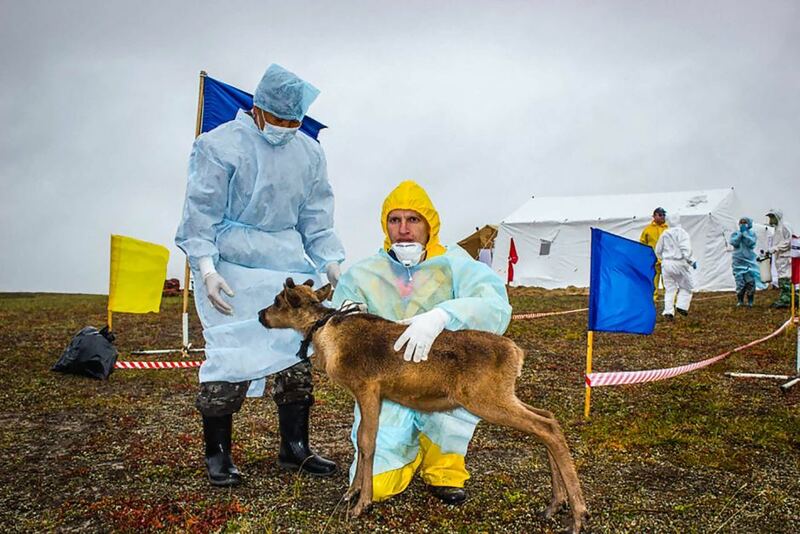 IF the virus doesn´t mutate. That the genome differences are insignificant would need to be proven. The northeast Brazil strain has 3 deletions: one is 15 nucleotides, and the others are 2 nucleotides each. Hemoglobin S differs from hemoglobin A by a single nucleotide substitution. Corrected on no birth defects in Polynesia by Umbrios. There were. Johnho, I known that it’s tempting to put blame in transgenics, but the association of Oxitec mosquitos and Zyka births defects is… oh, well. When a person doesn’t known Brasil it’s easy to be confused, but… Brasil is a few square kilometers short of being as big as Europe. Yes, I’m comparing a country with a continent. The nearest Oxitec mosquito release to the areas where Zika epidemics startes? The distance is greater than going from Paris to Berlim. Remembering that Aedes aegypt is not a good flyer, and does not migrate great distances, staying normally in a area of 500m2 from its birth. Meters, not kilometers. Distance between Oxitec tests and initial Zika outbreaks areas? More than 500 KILOmeters. umbrioso, thanks for the explanation. There is no reason to think that where there is microcephaly there won’t be arthrogryposis. Microcephaly is now reported in Puerto Rico and Florida, probably just a matter of time before arthrogryoposis follows. Whatever caused the apparent shift in pathogenicity of the Zika virus is acting established and spreading. And because it is quite uncommon, though not unheard of, for a micro-organism of known pathogenicity to mutate to a more toxic level, the issue is even more pressing. This is one nasty virus. johnho, if I understand correctly you are questioning what caused that shift, which is heavily centered in NE Brazil. I have some medical background, so here goes – The article from The Ecologist you referenced raises several basic scientific issues that might be at play. Given the incredible complexities of the systems involved, I wouldn’t hold my breath for a definitive answer anytime soon. Apparently those who study these things do not feel there is enough evidence for any of these mechanisms, at least given current knowledge. The Oxitec website outlines their method (http://www.oxitec.com/) and explains why they think it is safe. The release of their mosquitoes, where done, has been extremely effective and more releases are planned. 1. Transmission of the piggyBac transposon as used in the genetically altered mosquitos: The Zika genome sequence, as mentioned in the article, did not show evidence of the piggyBac transposon. 2. The transposon is DNA and the Zika virus is RNA, they really shouldn’t interact. But genetics at this level is an incredibly fantastic, ongoing battleground. Even more incredibly incredible things could shake out. 3. Environmental tetracycline (TCN) causing enhanced survival of the altered males – it is the levels in question. I don’t know the specific environmental TCN levels compared to the lab ones in which the mosquitos are grown. The Oxitec website says ” their offspring can’t access the antibiotic in the quantities needed to survive”. This is what I see now and all is above my pay grade. Nothing I write means I am an apologist for Oxitec or that I am comfortable with the whole thing. Genetics in general is early days yet, and who can guess what surprises are to come? I would stay tuned, and hope anyone else here who knows will chime in. Another PS: As Robert points out, the apparent change in pathogenicity could be only that, apparent and not real. Another difficult issue. Shout out to Wili who criticized a comment I made a couple of days ago on the kerosene cut vis a vis jet transportation–11% of crude oil fuel use. I probably had over imbibed on the ethanol cut leaving such an abrupt message, you guys and gals are full of knowledge. I think my point was something like gasoline was dumped when kerosene was used for lighting, there is a balance at how the different fractions of the hydrocarbon are utilized. Hence, to my thinking focusing on one segment of the demand throws the system out of balance without squelching total hydrocarbon burning demand. I may be wrong on this. “probably had over imbibed” No problem. I have on more than one occasion been guilty of the same, often with similarly embarrassing consequences. I would be interested in your further elaboration on this topic. It seems to me that, if there is usable ff energy, we will in fact use it, unless there are strong laws or perhaps market mechanisms put in place to prevent it. But I’d like to hear more about what you think about how the various uses of various cuts of oil might be used (or not) going forward. 1. Add government policy that increases fossil fuels price, reduces access, disincentivizes investment, promotes and invests in the alternatives, pushes energy efficiency and conservation, educates on harmful fossil fuel impacts especially including climate change, and empowers and encourages individuals to chose energy sources other than fossil fuels. 2. Promote social justice movements that target corporate access to fossil fuels, thereby putting upward pressure on price. 3. Promote social justice and policy movements that encourage divestment which reduces fossil fuel CAPEX for new projects. 4. Promote alternative energy as a replacement for fossil fuels (advertising, social justice, education, policy, business ventures — basically all avenues). 5. Encourage and enable individuals to make choices that reduce or remove fossil fuel use (advertising, social justice, education, policy, business ventures etc). 6. Encourage behaviors and energy use policies, technologies, and activities that increase energy efficiency and reduce energy demand. 7. Clearly communicate the risks and dangers of continued fossil fuel use. In other words, educate the public about the wide and varied damaging impacts of climate change. In other words, the above provides a comprehensive, if not extremely detailed strategy for keeping as much fossil fuels in the ground as possible. Fossil fuel use is not inevitable, in other words. It’s vulnerable on a number of fronts and especially due to the high level of capital investments necessary to keep projects going and the related political support required for those projects. FF also has a bit of a problem in that the new sources are harder to unearth and produce more harmful externalities. The thing to perceive here is not that fossil fuels are inevitable, but that they are supported by a kind of widespread institution and ideology. And that — not the mythical advantage of fossil fuel use — is why they are so hard to uproot. 2:30am last night T-storm # 16 roared in dropping I-don’t-know-how-much rain in the hours between falling asleep and getting up at 8am (it was still raining). CT sent an email saying her steep driveway washed out by 6am 8 miles south down the same ridgeline. She can’t get out in her Subi 4×4, it’s trashed. Sky cleared up and went blue & sunny & muggy as hell by 10am. 3pm it was 86’F in Chewelah (in the valley 15 miles north of me). At 4pm I watched from the alley behind Kathy’s 2nd hand store as T-storm #17 roared over the mountains 2 miles west throwing lightning bolts everywhere as it came up and over the peak towards town. Torrential downpours came with it, and the temp dropped to 66’F in ten minutes. Continued raining as heavily-laden clouds kept coming overhead, and rained on my way home after 6pm. Again, not a single weather caster saw these storms coming. Six storms since last Tuesday midnight, only one with a prediction of 20% chance of showers. This is getting freaky here, too, folks. But unlike last year when the Carpenter Rd. fire got within 4 miles and we all got evac’d out, the fires are getting stomped on quick. Trump thinks climate collapse is a crock. He’ll do nothing because of that. Hillary on the other hand takes huge amounts of money from FF industry and Wall St., pushes fracking around the world, and will sign the TPP (unless Obama does it as a lame duck-quite likely) which ends any chance of mitigating the effects of what we are already seeing happen to the climate. Corporate control is after all, it’s only about profit not the consequences and corporations will get to sue governments in a corporate-run court if they think they might lose any possible profit because of gov regulations. Frack the world baby, just like Obama’s drill baby drill. We are so screwed it’s scary, and I’m looking out the west window at another black/gray ugly t-storm rearing its head. Time to unplug everything again. It is doubtful that the Congress will ratify TTP. Both democrats and republicans are leery of the treaty. Furthermore, the democratic party platform, due to this opposition, has listed that it is neither for nor against TTP. “She is against it before the election and after the election,” he told reporters at the time. The progressive groups highlighted Podesta’s remarks in their letter to supporters. Progressive groups are doing their job and holding Clinton’s feet to the fire on TTP. And it appears that they have enough clout to keep it off the table. Lets hope this is the case. In any case, it’s my experience that counterpunch sometimes produces questionable stuff. I’d take the poem with a bit of salt. It’s a shade or two darker than actual reality on a few bits. Now, after more than twenty years of head-scratching, we finally have an explanation: the Mt. Pinatubo volcanic eruption of 1991. The largest eruption of the late 20th century, Mt. Pinatubo blew its top less than two years before modern sea level record-keeping began. According to research published today in Scientific Reports, the eruption cooled the oceans enough to briefly depress global sea level, masking the expected acceleration in the record so far. There already appears to be some acceleration in the graph (looks like we’re closer to 4 mm per year in the 2010 through 2016 end of the measure). Looking at earth.nullschool CO2 maps, it looks like the Sichuan region of China is one of the most intense carbon sinks on the planet right now. Their levels are close to 350 ppm of CO2, according to earth.nullschool, right now, suggesting that this region is an intense carbon sink. This is no doubt connected to vegetation growth in the late summer, as happens every year in the northern hemisphere. But, is that all that is going on? Looking at the photos on Google Earth, it looks like ordinary farms, grasslands, and seems lightly forested, not like some of the dense Canadian and Siberian boreal forests. Is it because of the Chinese reforestation Grains for Green project, in which stands of trees are being cultivated in an effort to sequester carbon? The maximum rate of change of carbon storage was said to peak in 2012 or so, but they are still having a high rate of change this year, and will be storing carbon through 2060, they say. Of course the Chinese are huge emitters of greenhouse gases these days, so they should be trying to sequester carbon. The total amount they are talking about sequestering by 2050 in this one program is something like 0.3 gigatons of carbon – compared to something like 2.4 gigatons of carbon emitted per year by China. Still, this program might show a way to slow climate change through massive reforestation. This is only one country, and only one reforestation program. We should certainly be doing this, I think, while slashing fossil fuel use to the bone, and also using BECCS to put carbon back underground. The Eastern half of the country is receiving at least average rainfall the last few years, and we should be planting stands of trees there, I think. Earth.nullschool map showing CO2 concentration down to close to 330 ppm in Sichuan China. This doesn’t look like a glitch, other areas are 400 ppm or above, as expected, and this has been going on for weeks. What’s going on? The Guardian had an interesting story on China’s approach to forests and forest dwellers and neighbours. They decided to hand over control to the locals, rather than exercise central control, and, mirabile dictu, it has worked out very well for all concerned. Apparently there aren’t any denialists in the upper echelons of the Chinese regime. Interesting. I wonder if they’re also using soil management or even biochar? If China can do 0.3 gigatons, why can’t the rest of the world do 1 GT? There’s a lot of opportunity in land management. And if we get fossil fuel emissions down to zero, it’s this kind of stuff that can help to bend the ghg curve downward. If Earth.nullschool is right, the lowest CO2 concentration is occurring at about 15:30 local time- 2:30 PM, in the early afternoon, just when you would expect the maximum photosynthesis to be going on. Unless this is a glitch, it appears to be on a daily cycle with the peak absorption being in the afternoon, if I’m reading the time right. Dunno what they are doing, but they seem to be doing something right. I am reading the time wrong. Earth.nullschool gives the same local time, no matter where you click on the globe. So, I think I understand the UTC value, but I’m not sure what is going on with the local time reading. Could this be an artifact due to fog in the river valleys screwing up the CO2 readings? Dunno. I’m even more baffled than usual. Darn, Earth.nullschool says that it’s 0600 UTC “now” when showing the CO map or most of the other maps, but says it’s 1930 UTC when displaying the CO2 map. The local time mystery is solved, that reads the local time at my location (pacific time) for most of the other maps, with some times updated more often than others, but is off by roughly 12 hours when displaying the CO2 map. So, it looks like the UTC time displayed for CO2 could be a bug within Earth.nullschool, with a discrepancy of maybe 12 hours or so. So the CO2 absorption maximum could still be in the afternoon, after all. But I’m twice as baffled as I was, suspecting both the visual and time data, now. I’m sorry to be posting so much. One last post and that’s it on this subject. This could be important, though, if it’s not a data artifact. Assuming a 12 hour glitch in the Earth.nullschool CO2 data (and it is 12 hours off when compared to most of the other Earth.nullschool maps) the visual data looks consistent to me. The low CO2 readings seem to peak in the afternoon, daily. The area is only moderately forested but it has very low carbon monoxide (CO) readings indicating low combustion activity and a rural area. So, the CO2 readings go lowest in Sichuan because it is a rural area, and the CO2 readings go lowest when photosynthesis is at it’s highest point during the day. So, sorry for the confusion, but it looks real to me, or at least makes a consistent hypothesis, I think. It looks like a real forest carbon sink, planted in a rural area, doing a great job at absorbing CO2, to me. We need a second source to confirm it, though. There is a lot of bamboo in Sichuan, iirc. Bamboo is one of the fastest growing plants in the world. If you have a forest of these things (such as the “The Bamboo Sea”), during it’s fastest growth period, I imagine it would be sucking up a lot of carbon indeed! Sichuan does have bamboo forests, like you said. The paper on the Chinese Grains for Green program lists several species including asian species of pines, cypress, fir, eastern cottonwood and eucalyptus. The low CO2 area doesn’t coincide with the bamboo forests so far as I can tell, but the CO2 output from urban areas could be masking their CO2 uptake. Eucalytus is fast growing, too. Likely, they are all fast growing, and were chosen for that. Thanks for that chain of comments, Leland. It´s indeed intriguing, and wonderful if your hypothesis is correct! Thanks for your reporting on the ground from Brazil, umbrios27. Great reporting on a sad situation. Like planting trees, an international environmental police force (or international funding aid for local law enforcement) might be relatively cheap and have big carbon dividends, maybe. What do you think of those ideas? An international envionmental police could be great, but would require such an epic ammount of diplomatics that the idea would probably be counterproductive. For example: it would require environmental laws to be more or less uniform in different countries, which they now aren’t. For example: pasturing cows in natural parks is illegal in Brasil, and legal in the USA. The Legislative effort to make the laws uniform would probably weaken those environmental laws that are more severe today. And different environments sometimes require different laws. For example: it was much touted here in Brasil recently (when we were discussing changes on our Forest Code), example, that oh so graceful and green Sweden doesn’t have laws protecting riparian areas from deforestation. Sweden doesn’t need those, so why would Brasil need to protect riparian areas? Those claiming that would put their hands in their ears and chant Lalalala when confronted with the fact that unlike Brasil, Sweden’s water mainly comes from glaciar melt (which is little affected by deforestation of riparian areas), and that the number of species of trees, birds, mammals, reptiles, insects, etc in the whole COUNTRY of Sweden is smaller than those numbers for the CITY of São Paulo, and so, the wildlife corridors made by forests in the riparian areas of rivers are crucial for keeping biodiversity from being destroyed in Brasil, but not so much in Sweden. What the law says needs to be ingrained to the point of instinct in a police officer, and different laws in every trip would make that impossible. Having stationary police officers could offset that, but it would also make the best feature in an international police useless. That best feature? Well, I’ll exemplify with an anedote of my life. In one of my stints in the Arc of Fire mission, when I was in São Felix do Xingu, in Pará, very distant from my hometown of São Paulo, one of the deforesters we were jailing tried to bribe my team. When the bribe was refused, he resorted to making menaces, saying that he would kill our families. I smiled and replied: “What’s the name of my son?” . He answered “Luiz”, a very common name here in Brasil, which would be a good bet… if I had a son. I laughed out loud, and throwed that in his face. “You don’t known me. You don’t known my family. And that’s all the garanty I need. You can’t hurt them, because you don’t known them, and you’ll never know them. You can’t bribe us and you can’t menace us.” THAT’S the best feature in an international police, and it also works in a Federal Police when people are outside their homestates (or maybe its because, like I said above, Brasil is almost as big as the continent of Europe). International funding aid for local law enforcement, though, would be quite more feasible, and much easier to implement. There’s already a bit of that. Norway and France have both invested in Brasil’s Federal Police in the 2000s, aiding us with sattelite monitoring which was crucial to diminish the deforestation rates. There are ONGs trying to do a bit of that, at least in theory (http://www.adopt-a-ranger.org/ ) but I don’t known their work firsthand, and an unsure if this is true or not. In Brasil, any such donation would go through a LOT of bureaucratic rope, to prevent bribes in disguise (the last private donation to investigation I remember seeing was not of money, but of actual lab test material). I’ve heard that international donations for rangers in some countries of Africa (if memory doesn’t fail, Quenia, but I’m not sure) is a huge part of their budget. That is a good idea, and can have a big impact, both in carbon offseting (hey, Brasil carbon footprint DIMINISHED in the 2000’s because of the fall in deforestation rates) and in biodiversity protection, which needs to defend not only tribal areas (like indigenous people reservations) but also natural parks and “human-empty” areas (seriously, cinegetic species tend to get extinct very fast in tribal areas nowdays). Wow, that is good information, umbrios27. Good to know. Good for you for standing up to the bribery attempt and even threats to your family. If we’re going to fight climate change, we’re going to have to fight greed and corruption worldwide especially in the U.S. Our Senator Inhofe, for example, is a national disgrace and the system that spawned this greedy Turtle from Hell urgently needs radical reform. The apparently daily variation in the CO2 readings is not limited to China, apparently. The same daily variation appears to be happen here in North America, in the Eastern U.S. It’s the same variation, apparently, but only if you assume that the CO2 map time stamp is 12 hours off, but that the time stamps on the other earth.nullschool maps are correct. So, assuming that there is a 12 hour glitch in the time stamp for CO2, we get the greatest drop in CO2 in the early afternoon, it looks like to me. He, I was not trying to highlight that, but… the reason I could laugh about the menaces was that I was a police officer from far, far away from the place I was being menaced. I’m from São Paulo, I was in Pará, and everyone in my team was from far away from there too. Being in a land of strangers has it’s qualities, specially when in a task force. Everybody does has their price, though that price is not always money… almost all police officers will balk from threats to their family if said threats are real and not empty. Any international police has this up-side: their members are harder to menace because they’re away from home. Federal policies have this quality too, in big countries. Local policeman facing threats in their hometowns have a far harder life. Magical. It puts humanity in its real context. 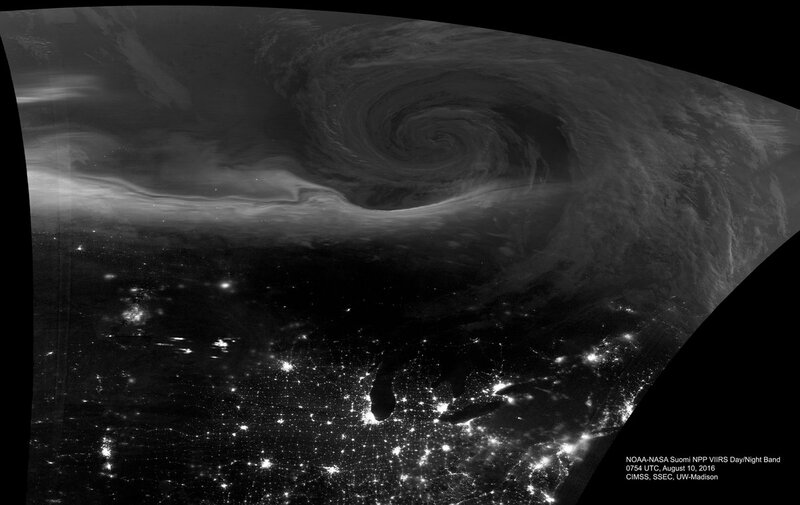 Heck of a storm there in Hudson Bay. Central Arctic may be firing up for a 965 to 970 mb event as well. Needless to say, the far north keeps generating spectacular weather. I just wish the context wasn’t so bad right now. Here is another article about the fires in southern France. “The fire is progressing. It’s progressing fast,” Marseille’s deputy mayor, Julien Ruas, said on BFM-TV. He said the city was setting up firewalls on the corridor leading toward it but if the fire passes those “it will move toward the northern neighbourhoods of Marseille”. A perfect example of why algae are showing up in water everywhere in greater numbers. It does not take much to reach a nutrient threshold and then some extra heat finishes the job. Both of these pools were blue the day before. Maria Lenk Aquatics Centre on Day 4 of the Rio 2016 Olympic Games on August 9, 2016 in Rio de Janeiro, Brazil. They madevey light of this on the olympics Thursday night. What is wrong with the people caring for these pools, it just isn’t that difficult to clean up a pool unless it is a very stubborn algae or bacteria. They postponed events because of weather ther , a few hrs to clean up a pool, especially over night shouldnt be that difficult. 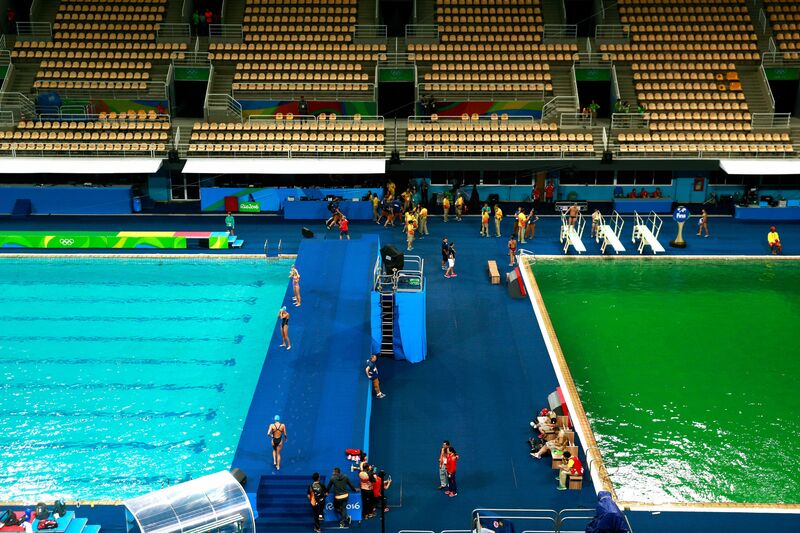 That green has enough bad stuff in it to possibly make someone even a little sick. Likely a pump/water filter stopped overnight. Stagnant water will do it. He said that the total affected area in the region, together with an established buffer zone, is some 12,650 square kilometres. This quote at the end of the article speaks volumes. “When there are destructive phenomena we think it would be nice to have prevented them, but as soon as the passions die down, everything is forgotten,” he said. You know the blob is a funny metaphor for this. That thing thrived on heat as well. How do we see ourselves on this blog? Are we park rangers? If you so choose to adopt the moniker of “facilitators of astonishment” then I am here to tell you brother that I find this to be more than apt! You folks, all of you, have contributed more to my astonishment on a daily basis than I would have ever imagined possible. If everyone read the blog posts, comments and links found upon these pages every day, we would have the revolution in energy usage that is required to save our future from AGW. Most fundamentally of all, the new dataset allows us to answer the three questions we posed at the beginning of this article. First, there is no point in the past 150 years where sea ice extent is as small as it has been in recent years. Second, the rate of sea ice retreat in recent years is also unprecedented in the historical record. And, third, the natural fluctuations in sea ice over multiple decades are generally smaller than the year-to-year variability. “Tens of thousands of litres of diesel may have spilled into the ocean from an oil rig that ran aground on the Western Isles. A federal court allows the Obama administration to incorporate the price of global destruction. Corporate America has a split personality when it comes to climate change. When issuing marketing materials and press releases, U.S. companies frequently warn that rising global temperatures could cost them money. They tout specific green projects, like solar roofs and increased efficiency. But when it comes time to report to the Securities and Exchange Commission, the same companies stick to broad terminology and sanded-down statements. Greenland sharks also don’t reproduce until they’re around 150 years old, a new study says. DES MOINES, Iowa (KCRG TV9) — About a tenth of a gallon of water is made by a corn plant every day during the growing season. According to U-S-D-A meteorologist Brad Rippey, that can have a measurable impact on the weather, though he says it’s not a dominant force. Roughly 14 to 15 ounces evaporate from a corn plant, which changes humidity levels. Rippey says then you factor in the 94.1 million acres of corn planted this year and add 30,000 corn plants per acre. With corn concentrated in one central area throughout the U.S. Corn Belt, Rippey says the crop can add a couple of percentage points to the overall content of water vapor in the atmosphere. If you get the right winds that can head to urban areas. – “Follow the money” here and you will get methane in the end. The major feed grains are corn, sorghum, barley, and oats. Corn is the primary U.S. feed grain, accounting for more than 95 percent of total feed grain production and use. More than 90 million acres of land are planted to corn, with the majority of the crop grown in the Heartland region. Most of the crop is used as the main energy ingredient in livestock feed. Corn is also processed into a multitude of food and industrial products including starch, sweeteners, corn oil, beverage and industrial alcohol, and fuel ethanol. 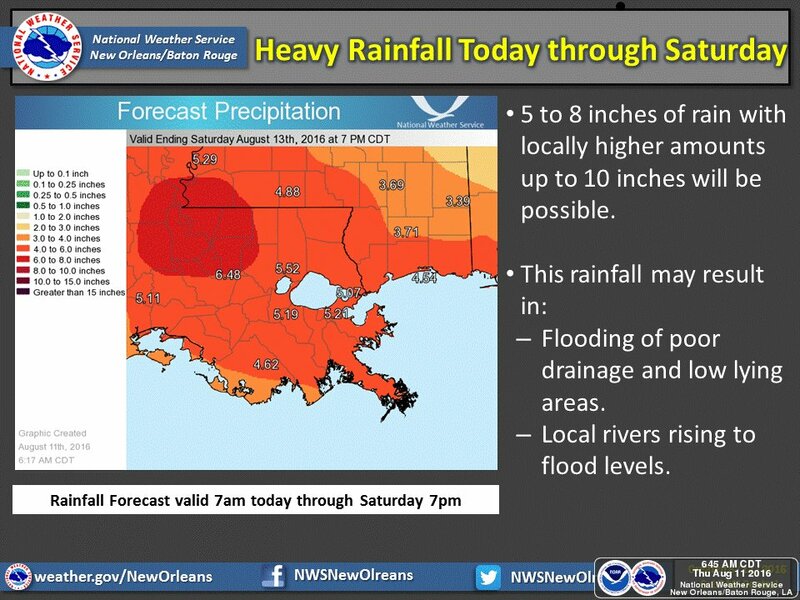 NWS New Orleans: “Scarily high” rainfall totals today, as high as 10-20 inches. St. Charles Parish has declared a state of emergency in response to heavy rain falling in the area. Parish President Larry Cochran made the announcement around noon on Aug. 11 as a precautionary measure in anticipation of further rainfall later this week. In New Orleans, the precipitable water was determined to be 2.78 inches Wednesday, which ranks among the top-five highest levels on record in August. “That is higher than some soundings [weather balloon measurements] observed here during past tropical cyclones,” the National Weather Service said. I was just over in Hong Kong and spent a lot of time learning about it. It’s a giant river delta system. Lots of low level building near water. But the Chinese gov keeps strict lids of info the Chinese get tho I’ve seen studies that more Chinese believe climate change is caused by humans than Americans do! Go figure. Keep in mind that the storm would not need to achieve the pressures shown in just one model to still be considered a very significant storm. This is one for us to watch. Looks like it might be a bit of a blender developing up there! Shaken AND stirred. An excellent article, nothing like building the largest mega city on Earth on soil with strength of a bowl of oat meal. The mind reels at what China has done, they make us look like a bunch of pikers. Agreed. Not sure why the emphasis in the article on the Mollisol soils as the foundations of the cities go deeply into bedrock. Mollisols are often found on calcareous limestones and sands which would be more relevant, especially if it was porous like Florida’s bedrock. Saltwater intrusion would be swift in coming decades before inundation comes. If China can move 120 million so rapidly into a sinking ship it can move them back out again but what a tremendous endeavor that will be. Greg, if it has to be done, the Chinese will do it. They are not inclined to waste energy aimlessly bickering over facts, unlike the denizens of the benighted Anglosphere. – I’ve yet to check it out but this looks interesting. 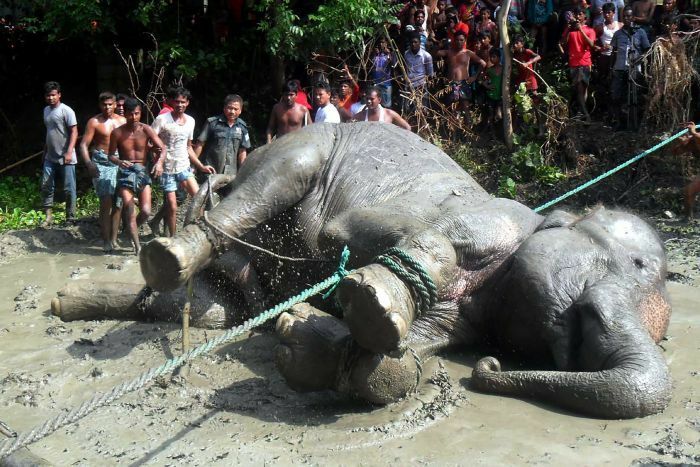 Good news on the elephant that was caught in floodwaters and washed from India into Bangladesh. She was spooked after being hit by a tranquiliser dart and ran into a pond where she almost drowned, if not for the efforts of hundreds of local villagers who were able to keep her breathing while pulling her from the water with ropes and chains. She’s now being transported to a safari park where presumably she won’t be shot by some cashed-up gun freak. We are not the selfish, greedy, stupid, people Mr. Trump thinks were are. My solar oven , the biggest ever built. The white is not white it is 97 per cent bright. I made 450F with this oven. I called her the Mária Telkes. Everyone read up on her. CB, There she is in a family 8mm shot at the world’s first solar expo, 1955. Phoenix. Only 64 views. Considering the Olympics is a big deal at the moment. “Increasing restrictions on when, where, and how the Games can be held owing to extreme heat are a sign of a much bigger problem,” he said. Health and safety of Olympians has been an ongoing story at Summer Olympic games. In 2008, air quality raised concerns in Beijing, while 2016 has been dogged with questions about polluted water and the Zika virus. Now, a new commentary co-written by UC Berkeley professors Kirk Smith and John Balmes, and others, says the future of the summer Olympics may be in jeopardy for another reason: heat. Among the findings, appearing in the The Lancet today: By 2085, only eight Northern Hemisphere cities outside of western Europe are likely to be cool enough to host the summer games. San Francisco would be one of just three North American cities that could serve as hosts. The commentary, “The last Summer Olympics? Climate change, health and work outdoors,” comes from a larger study about climate change. Iclimate400n the commentary, the authors explain how their findings can be used to examine the viability of future Olympic sites based on a measurement that combines temperature, humidity, heat radiation, and wind — their wetbulb globe temperature (WBGT). Researchers used two climate models to project rising temperatures over the next century and applied those results to current safety procedures used in determining the viability of a host city. The “summer” Olympics are being held in Rio de Janeiro´s winter right now. While the ideas of a non-itinerant Olympics headquarter and specially of not actually fullfilling those prognostics by curtailing fossil fuel use as fast as possible (not adding economically in the phrase) are lovely, I´m not so optimist to think that they´ll happen… it´s more probable that COI will just do Olympics in winter, like now. How they´ll find cold enough for the Winter Olympics is a better question. Baghdad: Record-shattering temperatures this summer have scorched countries from Morocco to Saudi Arabia and beyond, as climate experts warn that the severe weather could be a harbinger of worse to come. UN officials and climate scientists predict that, in coming decades, the region’s mushrooming populations will face extreme water scarcity, temperatures almost too hot for human survival and other consequences of global warming. If that happens, more conflicts and refugee crises – far greater than those currently under way – are likely, Adel Abdellatif, a senior adviser at the UN Development Program’s Regional Bureau for Arab States, said. “This incredible weather shows that climate change is already taking a toll now and that it is – by far – one of the biggest challenges ever faced by this region,” said Mr Abdellatif, who works on studies about the impact of climate change on the region. These countries have already been grappling with remarkably warmer summers in recent years, but this year has been particularly brutal. Parts of the United Arab Emirates and Iran experienced a heat index – a measurement that factors in humidity – that soared to 60 degrees in July, and Jiddah, Saudi Arabia, had an all-time high of nearly 52 degrees. Southern Morocco’s relatively cooler climate suddenly sizzled last month with temperatures surging between 43 and 47 degrees. In May, record-breaking temperatures in Israel caused brush fires and a surge of heat-related illnesses. But the temperatures in Kuwait and Iraq startled observers. On July 22, the mercury climbed to 54 degrees in the southern Iraqi city of Basra. A day earlier, it reached 54 in Mitribah, Kuwait. If confirmed by the World Meteorological Organisation, the two would mark the hottest temperatures ever recorded in the eastern hemisphere. The bad news isn’t over, either. Iraq’s heat wave is expected to continue this week. Stepping outside is like “walking into a fire”, said Zainab Guman, a 26-year-old university student who lives in Basra. “It’s like everything on your body – your skin, your eyes, your nose – starts to burn,” she said. Guman has rarely left home during daylight hours since June, when temperatures started rising above 49 degrees and metal objects outside turned into searing-hot hazards. About that time, Aymen Karim also began feeling trapped. The 28-year-old engineer at a government-run oil company in Basra said employees were ordered to stay at home for several days over the past month. He and his family try not to go outside before 7pm. Bassem Antoine, an Iraqi economist, said the weather has inflicted serious damage to the country’s economy. He estimates that Iraq’s output – about $US230 billion ($US298 billion) annually – has probably contracted between 10 and 20 per cent during the summer heat. 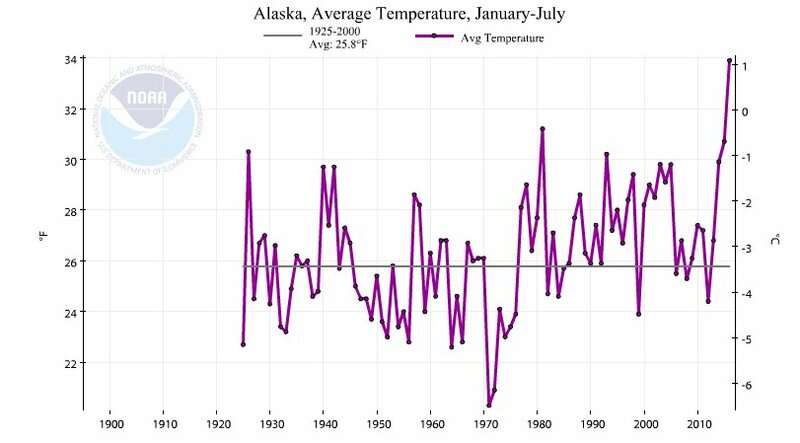 We’ve entered a new phase of global warming: Alaska has just jumped above the melting point. And it’s not just the air temp. The waters off NJ are well above the threshold required to support tropical cyclone development. That’s crazy. Are you sure about that, Robert? Maybe that’s what MSM say, but going to the “battlefield” and looking more into detail, things do not appear to be like that. “A ministra da Administração Interna, Constança Urbano de Sousa, mostrou-se nesta quinta-feira insatisfeita com a resposta dos parceiros europeus ao pedido de ajuda de Portugal para enfrentar os muitos incêndios que lavram no país. “The Minister of Internal Affairs, Constança Urbano de Sousa, was quite unhappy on Thursday with the response of the EU partners to the request from Portugal for aid, due to the many forest fires raging in the country. Germany has a solidarity tax that shows up in all pay slips, but this solidarity is mainly towards the former GDR states. If it were for Portugal to build even more motorways so that it would buy even more Mercedes, BMWs, Audis, Porsches, Renaults, Peugeots, etc., then the EU will extremely supportive. I have no available link to the 3 aircraft sent from Spain and Italy to aid the fire suppression but it was clearly stated on the Spanish National news a couple of days ago. A lot of the Portuguese fires were near the boarder with Spain which has several fires at the moment but it would certainly be possible for them to send planes over the boarder. The only requirement would be for the Portuguese to direct them in their air space. Moroccan aircraft aid would be very simple to Madeira as it is directly off the west coast of Morocco. Gales for the last 4 days over southern Spain are set to die down soon leading to much increased heat again. No rain forecast for the South west coasts of Spain. The Moroccan planes did not go to Madeira, they went to mainland northern Portugal. It is almost impossible to use airplanes in Madeira to fight any kind of fires. The Italian airplane was promised but went instead to France due to the fires there. I have no information about Spanish planes being used in PT now but do know that Russia has just sent two firefighting Beriev planes to Portugal, they should arrive early tomorrow. And this is why I keep bringing up Noctilucent Clouds, which in essence are Hydrogens way out into space. Up to 10 inches of rain had fallen in some locations across the region by Friday morning. 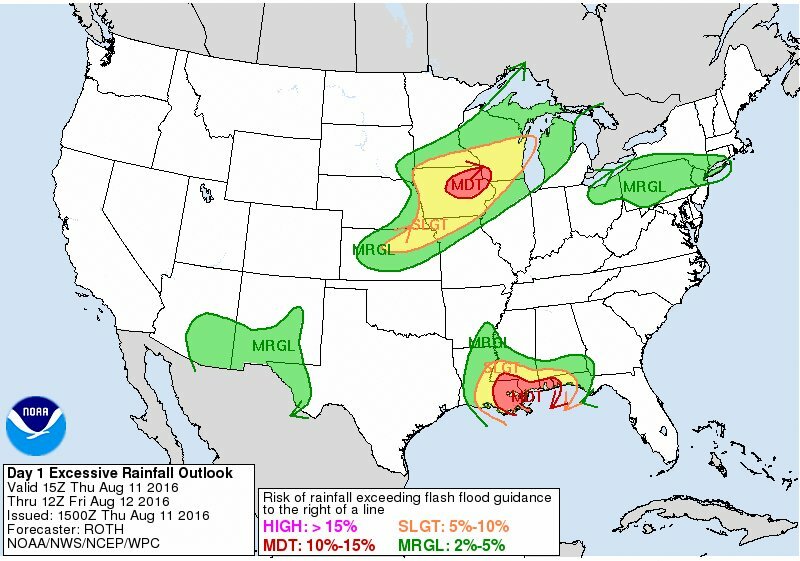 The heavy rain will continue over Louisiana and Mississippi through at least Saturday morning, said weather.com meteorologist Tom Moore. “It’s going to going to get a whole lot worse before it gets better,” Moore said. NEW ORLEANS (AP) – Heavy rain and widespread flooding in Louisiana lead the governor to declare a state of emergency on Friday, with more rain expected over the state through Saturday. Numerous rivers in southeast Louisiana and southern Mississippi were overflowing their banks and threatening widespread flooding after extreme rainfall, the National Weather Service reported. My friend, a real energy nerd, think this will be revised to 2040 in a couple of years, then shortly after that 2030. I tend to agree. This is mostly semiconductor tech and as such adheres to Moores law. I live in San Francisco and people like Elon are truly innovating and not just incrementally. It will happen even faster if democrats are elected and we concerned folks really push for change. Of course Trump could probably delay it. Louisiana tonight: here is Eric Holthaus.